Beer Nerd Details: 13.10% ABV bottled (375 ml capped). Drank out of a snifter on 11/9/12. I am now officially excited for Red Thunder, as I think this sort of treatment might be better integrated into a slightly less hot base beer, but I guess we'll find out. I'm sure I'll pick up more of these Black Hole variations (in particular, it seems the Cognac version is popular) at some point, but I wouldn't expect to see that anytime soon. My cellar is becoming unruly again. I wouldn't use this as an top level example of beers aged in red wine barrels. I've had a few and they vary a ton. I didn't like this that much as I found the tannins from the red wine fought desperately for control with the base stout and not in a good way. I thought the white wine version was much better. However, I think Dock Street's 2010 Prince Myshkin, on the other hand, is an excellent example of how right aging in a red wine barrel can go. Of course, some of the sharpness of the barrel was removed since they had aged their barleywine in it first, but still. Regardless, I wonder about Red Thunder. I didn't think Dark Intrigue was that good and don't feel that Victory is that good at barrel aging. I'll definitely be waiting for reviews of Red Thunder before acquiring a bottle myself. The flavors certainly weren't integrated into each other as much as I'd expect, but it worked well enough for me, even if it didn't blow me away. I think we've discussed Dark Intrigue before, and I really enjoyed it... It seems to be a love or hate beer. Lots of folks on BA seem to hate it, but there are plenty that seem to love it too. Divisive beer, I guess. I'm not expecting Red Thunder to blow me away or anything, but I'm hoping it will be more integrated than this black hole beer (which, while not a top level example, will at least give me a basis for comparison). Fingers crossed. It's not really that out of the way for me to pick up a few bottles, and these are significantly cheaper than Dark Intrigue, so I figure it's worth the stretch. Yeah, the cost of Red Thunder makes it easier to swallow. And I didn't think Dark Intrigue was terrible, just mediocre. Not sure that's really better but still. As far as Dock Street, I'm actually planning on being at that release for a bit. I want to say that the Barrel Aged Prince Myshkin being sold is actually the version I was talking about. They've had bottles of it for a few years now. This page contains a single entry by Mark published on November 14, 2012 10:12 PM. Double Feature: Ola Dubh and Highland Park 12 was the previous entry in this blog. 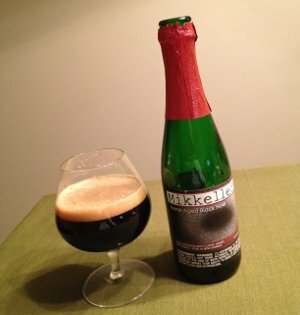 Novembeer Club is the next entry in this blog.